After years of minimal sleep and constant hovering over infants and toddlers, I really appreciate the little things about having older kids. Things like talking with my husband over coffee in the morning (thank goodness for Saturday morning cartoons) or staying up late to watch a boring British mystery movie knowing the kids will sleep in past 7 a.m. Now that both kids are officially out of diapers, feed themselves, and can talk (not necessarily without whining), a small amount of free (me!) time has even crept into my weekends. This Sunday, I had a chance to sit on the couch and watch a cooking show on television. I know this doesn’t seem like much of an event, but for any reader with young children, it’s momentous. Sam joined me on the couch, pretty unimpressed with the looks of the recipe until I explained that the chefs were cooking the chicken in broth. Sam immediately perked up at the mention of broth. The kid loves anything with broth in it. Weird, I know. I had most of the ingredients in the house (and garden) to make this Italian‐style braised chicken dish and what I didn’t have, I left out. My stripped down version of the recipe came out great. The chicken was tender, the skin still slightly crunchy, the sauce silky and rich, and the sage and lemon adding a nice spike of freshness. Definitely a keeper. 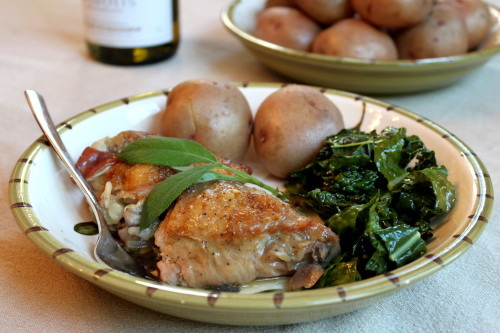 I served this initially with boiled red potatoes and sauteed kale. For leftovers the following night, I made polenta and peas instead. Though both meals were eaten and enjoyed, we slightly preferred the polenta and peas combination. Adjust the oven rack to lower‐middle position and heat the oven to 325°F (160°C). Heat 1 tablespoon of oil in a large heavy‐bottomed ovensafe skillet over medium heat until shimmering. Add the prosciutto and cook, stirring frequently, until just starting to brown, about 3 minutes. Add the garlic slices and cook, stirring frequently, until the garlic is golden brown, 1–2 minutes. Using a slotted spoon, transfer the garlic and prosciutto to a small bowl and set aside. Do not rinse the pan. Increase the heat to medium‐high; add the remaining tablespoon of oil and heat until just smoking. Pat the chicken dry with paper towels and season it with ground black pepper. Add the chicken, skin side down, and cook it without moving until it is well browned, 5 to 8 minutes. Using tongs, turn the chicken and brown on the second side, about 5 minutes longer. Transfer the chicken to a large plate. Remove all but 2 tablespoons of fat from the pan. Sprinkle the flour over the fat and cook, stirring constantly, for 1 minute. Slowly add the wine and broth; bring to a simmer, scraping the bottom of pan with a wooden spoon to loosen any browned bits. Cook until the liquid is slightly reduced, 3 minutes. Stir in the cloves, sage leaves, bay leaves, red pepper flakes, and reserved prosciutto and garlic. Nestle the chicken into the liquid, skin side up (skin should be above the surface of liquid so it stays crisp), and bake, uncovered, until the meat offers no resistance when poked with a fork but is not falling off bones, about 1 hour 15 minutes. Check the chicken after 15 minutes; broth should be barely bubbling. If bubbling vigorously, reduce the oven temperature to 300°F (150°C). Using tongs, transfer the chicken to a serving platter and tent with foil. Remove and discard the sage leaves, cloves, and bay leaves. Place the skillet over high heat and bring the sauce to boil. Cook until the sauce is reduced to about 1 1/2 cups (350 ml), 2 to 5 minutes. Off the heat, stir in 1 tablespoon of the lemon juice and butter. Season to taste with salt and pepper. Taste the sauce again and add the remaining lemon juice if desired (I like a nice kick of citrus with chicken). Pour the sauce around the chicken and serve.